Although seen today as a quiet village, St Day was once a populous and thriving town serving one the wealthiest mining areas in the world. This trail invites you to explore this fascinating settlement, with its historic streets and buildings, and find out more about its industrial past. The valley you start along, the Poldice Valley, has a long history of mining related industry dating back to at least 1512. Among the many remains including walled mine shafts and chimneys are what is left of the mid 19th century arsenic works where arsenic was condensed from gases into crystal form which was then exported across the world for use in insecticides and industrial processes, such as glass making. In the first half of the nineteenth century St Day was the service centre of the wealthy Gwennap mining area, with numerous shops, inns, markets and chapel, as well as workshops, including one operated by William Wilton producing scientific instruments specifically for the mining industry. In 1875 the Unity Safety Fuse Company opened its new works at Little Beside. The company moved here after six women and girl workers were killed in a serious explosion at the company’s earlier works at Wheal Unity Count House. The works were later taken over by Bickfords and continued in operation until the end of the First World War. Nearby was Fitton’s Velveteen factory that employed around 40 local women in the 1880s and 90s. Disability access – a bit too far to push a wheelchair but if you have an electric one or scooter you should be ok. Likened by the Poet-Laureate, Sir John Betjeman, to “an ecclesiastical toy fort”, the Church of Holy Trinity, now known as St Day Old Church, was built in 1826-28 to accommodate a congregation of 1500 in the booming mining town. 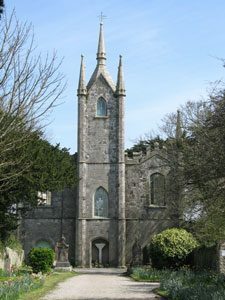 In 1956 a controversial decision was made to close the church due to structural concerns and the roof of the abandoned building was removed in 1985. Today, following stabilisation works, the church is used as a community venue and is open to the public during the summer months thanks to the tireless efforts of local volunteers. The history of St Day and the surrounding area is told on display panels inside.